The colours used in larger portion in the blanket formed my weft choices: lilac and peach. Remember, at the time the project was planned, we didn't know it was a boy so all choices were gender neutral. ... and the peach version. Oh, he's going to be one spoilt baby from all the visitors, and relatives that have been lining up to see him. I'd come to appreciate the quieter life here on Vancouver Island with no big city stuff such as traffic jams, pollution (noise, light and air) and more affordable living. Now I feel too far away! I guess we'll be going over more often and we can look forward to them coming here. My daughter in 1986, chosen to the the flower girl at the 100th anniversary celebration of the CP steam locomotive 374's arrival in Vancouver. From Babies to Birds, to Bookmarks! So our new little man, Ethan is 4 days old and now settling in at home. We are hoping to go over and visit him and his parents very soon. I have no doubt that they need a few days to themselves. I'll be sure to get lots of photos then! In the mean time, here is a precious picture taken the night he was born with a mobile phone. I have this one printed out and hanging in my studio. Lots of fresh new starts... it is spring after all! We seem to have a pair of last years hatchlings back trying to work out how to build a nest. We have an open beam roof above our front door and I guess it looks like a condo to them and they can't decide which one to settle into! I say 'they' as I haven't actually seen which species of bird is doing this! They don't actually get much of a nest made and then move onto the next spot. There is a huge pile of twigs and grass off to one side from several days worth while they run to the 'store' for more! Okay, while we are outside: we are having revisit the front garden bed where they dug through to install the water to the house in our new well escapades last fall. There is a green junction box that we can't bury and it looks stupid sitting there in the middle of a flower bed. So we have a large pot to hand and we bought a new miniature Japanese maple. Just need to get the bag of soil tomorrow. Its a start. I'm going to hang baskets everywhere this year and just waiting on better weather and bigger baskets to show up! Okay, lets shift to fibre / weaving stuff! Another start is the finishing of the third shawl and I waded through one side of fringing and just set up today to work on the second side. Beading will also follow... so a bit more time is required before its ready for the big reveal. So lots of starts and much to do, but no rush.... when the sun comes out, I've been slipping the chair and spinning wheel outside on the deck and take a break there. I'm going to smell the flowers more this year. He weighed 8 pounds 4 ounces which just happens to the exact same weight his father weighed when he was born! Little fellow did not want to come out and took at least three inductions, each getting more serious than the last, and finally he was coaxed out to join everyone. A very happy Nana and Grandad! So we got word today that the baby is getting a nudge to come out this weekend and Mum will be induced on Saturday. So either Saturday or Sunday will see a new little person arrive and join the family. There are three great grandparents, three sets of grandparents, parents, as well as many aunts and uncles, cousins, and family friends all waiting to say hello! Geesh, no wonder they don't want to come out! I immediately prepped the loom for another project that has been sitting waiting for its turn. I had to enlist Bruce's help to wind it on as the fine 40/2 linen was twisting on itself and I didn't have enough hands! Then the loom was hoisted up onto crates for its new tie up of twelve treadles for the twelve shaft project. Past the half way point! Doesn't look very dignified does it? But it works well and sitting on a low stool keeps me off the floor. The warp looks rather narrow. Its actually only 2.5 inches wide and is 48 ends per inch. Its a repeat of the book mark project, but this time I'll be weaving 19 or 20 of them. Well, that's the plan! I was feeling pretty good so thought I would weave off the last few inches of the receiving blankets on the big loom and also some samples. It didn't take long and they were cut off the loom. I'm able to pull up all treadles and then vacuum underneath with little interference....except for a certain 'Fur-face" who stuffs her toys underneath the treadles. I also used the brushes on the loom to get all the lint, especially on all the cords. Here's the view from the back in 'vacuum-mode'. I know the cords look intimidating but remember I only use a small portion of them at at one time. To use all of them I would be using all twelve shafts *and* all sixteen treadles. (Some summer and winter drafts could come close to this.) Anyhow, back on topic here... I was vacuuming the cords as they run along the top of the treadles and saw a big 'fluff ball' and aimed for it. It did not go up the hose. It stayed put. What the heck? So I took a closer look.... O.M.G.! I slipped a note book in to show the problem better. This is one of many, but it is the worst of the bunch! How I managed to weave off the receiving blankets is beyond me! Texsolv is one tough cord as that is handling the weight of the entire treadle, shafts and lamms! How does this happen? Well, all my tie up cords run down from their spots on the upper and lower lamms and then travel through eye rings set in rows on the centre of the treadle. One eye ring for every cord and every cord has it own sequence. This older picture shows the cords in the process of being set up when we moved here four, nearly five years ago. Upper lamm cord goes down one side and lower lamm cord runs on the opposite. This is where all the rubbing is going on during the weaving! Pulling the cords to their extreme position exposes the damage. Somehow I'm glad I missed the vacuuming last time as it would have stopped me from weaving these receiving blankets. Since I did, I'm grateful the cord hung on like it did! 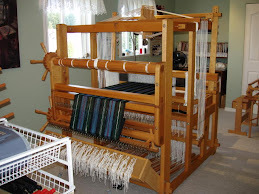 Most of my projects use anywhere from eight to ten (or sometimes twelve treadles) and I normally use them centered under the loom, so the outer two or four on either side are rarely used. The centre bunch get stomped on time and again... and all are running and rubbing in the eye ring. What you saw was the result of many years of much treadling! Moving parts will wear out. A phone call later today with John at Woolhouse Tools and it was decided that it is best to replace all cords in the centre twelve shafts and twelve treadles so I'm working on a clean slate. The best of the older cords can be used for future repairs, which you know is going to happen at some point in time. With the cords on their way, the loom will be stripped of all cords and it seems to me to be a good opportunity to clean the old gal and give her a much needed oiling and tune up. She's earned it. Okay, that loom is now out of action. I guess weaving 20 book marks using fine 20/2 cotton weft on the Louet Spring, and all that hemstitching won't exactly be a snappy project! In the mean time I have some hemming to do! ..... and there's not a moment to lose! Waiting around for the big day is exciting and so I've been keeping myself busy with another project for the baby and making receiving blankets. The larger crib blankets were fairly neutral in colour (white, beige and a crisp green) and so I wanted receiving blankets that would be colourful and complimentary with the other blankets and also go with the crib and baby room decor. Both side borders are in a soft lilac, with alternating stripes of peach, gold and a pastel green. The width is 36 inches in the reed and the sett is 24 epi and the warp length is four yards, for three blankets, samples and take up and loom waste. The pattern? What else could it be, but hearts! Fully reversible hearts too. I believe the draft came from Handweaving.net (I forgot to make notes on that!) If I find that the source is different, I will edit the change in later. The lilac and peach stripes are the wider ones of the four colours and so I decided to use all lilac as weft for the first one, and all peach for the second blanket. 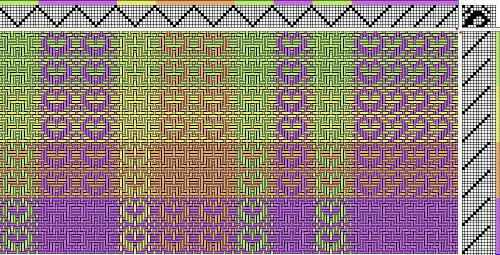 The third would be a plaid using all the colours in the warp as weft. I'm using a temple which requires frequent moves and chugging along. I'm about half way on the third blanket. As you can imagine, I'm okay with the baby taking its time! I'm finding between the wider warp and throwing the shuttle and the treadling, its aggravating my lower back and so I can only weave for a short time and then must switch to either the other loom or another task in the studio. But there's not much more to go and I'll be hemming soon. I'm thinking of some kitchen towels on the big loom next and so looking at drafts for that. Maybe more stash busting? They'll be a skinny 24 inches wide and will be a breeze! Now on the Louet Spring loom, I'm discovering that third time is *not* a charm but soldiering on with it. It will all work out in the end. The aggravation factor is huge... but that's a story for next time! It's Easter weekend, or a late Ostara celebration, Passover or just another weekend if you are so inclined. Whatever you are doing, I hope its going well! I recently had another one of those annual nuisances called a birthday. I won't say which grand number it is now but needless to say they are starting to pile up larger than I can hide under a rug. I was born right on the cusp of winter evolving into spring. Four hours more would have put me into spring! I think everyone is so ready for all the spring flowers and trees with buds by this time.... winters can be long and you start to get cabin fever! I was also gifted with a Bonnie Tarses Horoscope colourway. I can't show you as Bonnie asks that the paperwork not be reproduced and I happily oblige. A visit there to her page will explain how she reproduces a colour draft based on your astrological horoscope. Its woven up in plain weave but contains *many, many* colours and even with a stash like mine, I need to get some more colours before I can attempt it. (Lunatic Fringe has a great rainbow selection.) Thank you Bonnie! While away recently at the Retreat, I did purchase some spinning fibre in a lovely shade of green called "lichen" by Louet. It's 20% silk and 80% merino. I'm looking forward to spinning this up on the wheel while sitting outside in the spring air real soon! I've been waiting for a brighter sunny day to photograph it and even still the colour is actually a slightly stronger green than my screen shows. I'll spin it lace weight and see what it tells me to do with it later! Lastly, not many can say they have a limerick written up about them! weaving beauty with nary a rest!" This was inside my birthday card from Lynnette. Pretty darn clever huh? I'm back home again... just! Parts of me are still reviewing the retreat hosted by the Qualicum Beach Weavers and Spinners Guild and held in Parksville, BC. and my time away, while the rest of me is doing laundry... back to normal again. It was a fun time and it was especially neat to spend it with Lynnette. I'm very lucky in that she's an easy and caring room mate and I enjoyed our adventure. The sun was shining when I left and by the time I reached Nanaimo on my journey north, I was driving through snow! Mostly driving rain and lots of water on the road, but still snow. I can recall telling myself that March was not going out like a lamb! I finally arrived and met up with Lynnette and we settled into our room at the Quality Inn Resort. Its a very shallow flat bay and at low tide many people were out walking on the flats. I could imagine a sunny warm day and going walking in the shallow water pools! We took our spinning wheels downstairs and set them up.... then went to the vendors room and went shopping! Unfortunately, I didn't take any pictures in there but there were four vendors: Knotty by Nature (from Victoria), Pagan Creations (from Campbell River) and Hummingbird Fibres (from Errington) and PCW Fiberworks (from Saltspring Island. I bought some spinning fibre but nothing else... despite being labeled a 'spinners and *weavers* retreat, none of them really brought anything weaving related! No yarns, no books,.... nada! Rather unfortunate but I do have a full stash so can't grumble. I hope that next time they will reconsider their inventory. 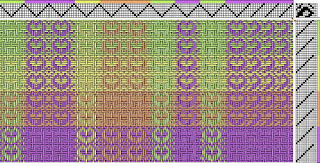 Double weave placemats by Sharon S.
Defected double weave scarf by Jennifer V.
It took me a long time to wind down and finally go to sleep that night! 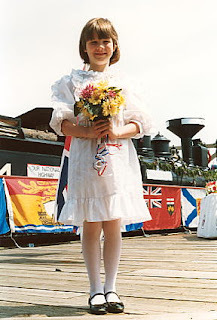 Even then, I watched the clock advance all night long. The best sleep was the hour before the alarm of course! There were other presentations: all about PCW Fiberworks with Bob Keates (which I have taken before), and a talk and slide show on Peruvian Textiles by Judith Crosbie which I hear was very good and I'm sorry that I missed it! There was also a bag exchange. Make and bring one...get another to take home. There were some very creative bags! Here Lynnette is sitting on my seat and chatting with Heather. Looks like Heather's unique Scottish Haldane wheel (built in Fife, Scotland) is getting a closer inspection. That's my Majacraft wheel in front of Lynnette. The spinning room was destined to become the banquet room for that evenings dinner so we went to our room for some quiet time and to get ready. Every one was back at 6 pm for dinner and wearing their finery. The dinner included roast beef, pork medallions and salmon and it was all delicious. Finally it was fashion show time and there were twenty four entries. Here are a few entries and there will be a link to all photos at the end of the post. A stunning coat with card woven band details. The weavers hand shake was happening all over the room! My thanks to Gloria for modelling the Little Lochmaben shawl. Here Sharon is waiting her turn to take the shawl Aurora for a walk around the room.